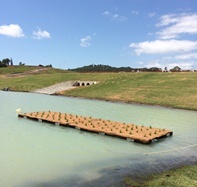 Parklakes II, a master-planned residential community within Bli Bli on the Sunshine Coast of Queensland, Australia, will soon be home to a unique floating wetland installation. The first of the 230 pontoons that support the vegetation were launched Nov. 25. Eventually the pontoons will cover 2100 m2 of a 2.5 ha lake and will be made from recycled bottles. This $1 million installation will be one of the largest floating wetlands constructed within a greenfield development. The wetland reeds planted on the pontoons will help to filter stormwater runoff from the 436-lot development. The innovative project is a result of a strong commitment to improve local waterways. It is a collaborative effort between the Sunshine Coast Council, local engineering consultancy Covey Associates, and the University of the Sunshine Coast (USC). The system will be the subject of a 3-year research project by USC. Researchers will investigate, monitor, and evaluate the performance of the floating treatment wetlands.